Marine grade polymer or (MGP), made of High-Density Polyethylene is one of the best options for patio furniture because it’s a durable material that’s 100% recyclable and made in the USA. Since many patio furniture shoppers are looking to invest in a high-quality patio furniture set, we wanted to give you a quick guide to the 10 benefits of marine grade polymer furniture. MGP has been used for more than 20 years in the shipping industry as the preferred material for topsides of sailing and motor yachts. It’s used in the production of cars as HDPE fuel tanks are lighter and help increase fuel efficiency. The list of the different uses for HDPE goes from bottles and containers to bags and cereal box liners. It’s a versatile and popular material due to its flexibility and eco-friendliness. Because MGP is a strong material, it is also impact resistant. This means that if your child starts banging the MGP table with a utensil, the table won’t become damaged. MGP has been used to manufacture children’s toys for the same reason, it won’t break or become damaged upon throwing it around. Additionally, MGP won’t rot, crack or separate in any outdoor environment. Because MGP is colored during the creation process, rather than coated with paint, the paint will last a long time in its original state. Also, scratches won’t show a different tonality underneath the surface, so you can rest easy since your patio furniture won’t become discolored with the sun, or accidental indentations (if they do happen). One of the most attractive benefits of MGP furniture is it’s resistance to the weather. MGP has zero porosity which means that it is mildew and mold resistant and water cannot penetrate it. It does not swell, warp, or rot under any weather conditions. 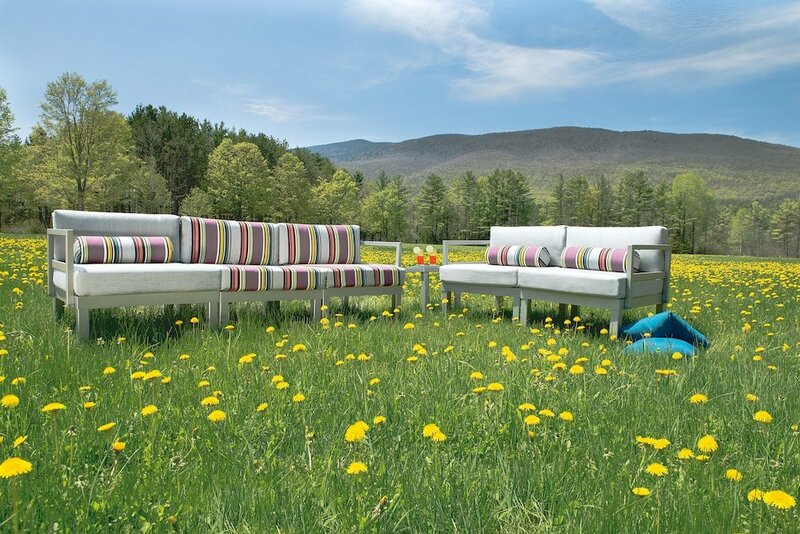 This is a truly unique quality among all furniture materials and makes MGP a very popular choice for patio furniture. Marine Grade Polymer furniture is clearly a top option for your patio furniture set. If you are looking for a brand that sells this type of furniture, we recommend Telescope Casual Furniture. Telescope has been honored with an ICFA Design Excellence awards in 2008 and 2012, as well as a resin furniture Manufacturer Leadership Award in 2012. It’s made in the USA, uses certified high-grade MGP and you can order it online to ship to your home straight from our site.